With apologies to Pete Seeger this media mama is having a déjàÂ vu moment blinking back to the corporate missteps of Target underestimating the social media sphere and choosing not to acknowledge “alternative media’s” customer concerns. 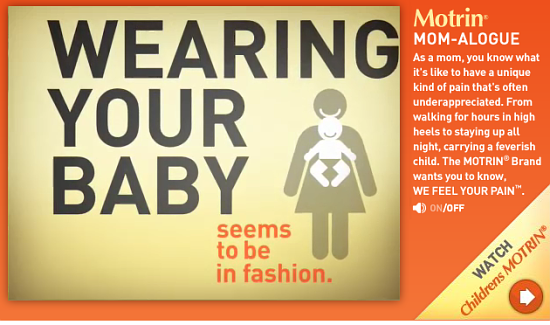 The absurdly patronizing copywriting (ad/video here) is trying hard to be ‘hipster’ and offending everyone in the process…“Wearing your baby seems to be in fashion…I mean, in theory it’s a great idea. There’s the front baby carrier, sling, schwing, wrap, pouch. And who knows what else they’ve come up with.” Ahem. They? THEY? That would be “you” ad agency copywriter. And if I wanted to be generous, I’d add ‘or me’ since that’s part of my background as well. “Jessica? This is Amy…I’m extending All Things Girl week on Shaping Youth, and even though this “Motrin Mom” kerfluffle is not limited to women/girls, since you started this firestorm, I wanted to get your take on exactly happened before it turns into another hype-fest like I endured with the Target debacle. 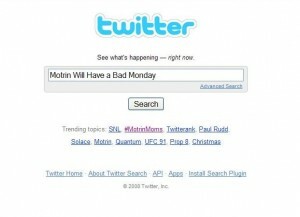 So first off, why do you think this Motrin ad offended so many, so fast, and landed on moms so hard? What was the timing between the ad airing and the backlash and video responses? 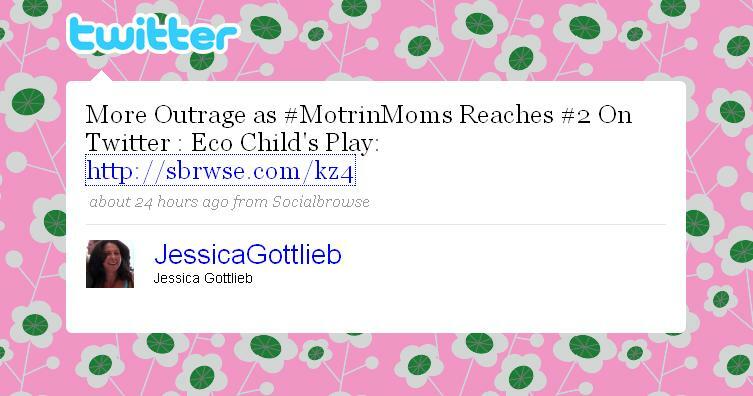 Jessica Gottleib: Well, first of all, it was mean-spirited, not funny and not just anti-woman, but anti-baby, anti-family…This is a tender time, a meaningful time…you don’t start taking cracks at new moms, there should be some sort of limitation that says, “not in the first year”…no picking on this audience whatsoever, they’re adjusting to too many new things as it is. Unfair. Not cool. I’m not being prickly here, I write for National Lampoon, I’ve said “farewell to my youth in a satirical ode,” I’ve made fun of myself a million times over, but this is different…it’s patronizing and mean. As far as I’m concerned, you only have permission to make fun of yourself. New moms are off-limits. Second, every marketing executive should have a Google alert keyed to their company name, website, e-mail, the works so that the minute those Google spiders started picking up a feed, they could respond. If they would’ve just answered and replied with a genuine response or sincerely apologized it wouldn’t be on the front page of the most talked about live chat items right now. Shaping Youth: Maybe they were going for empathy and missed the mark; but seriously? They never apologized? At all? Jessica Gottleib: Not to me. I saw a form letter apology posted on a bunch of other blogs, but even though I’d sent an e-mail through their form on their site I was NEVER sent out an apology! I found out from other people that they’d send out an e-blast of some sort…I saw screenshots on other blogs. So what would YOU do now if you were Motrin? I dunno, what could that cost? Maybe $200K or so? My kids are 7 and 10 so they’re big… But for all my neighbors, girlfriends, sisters, and friends that ARE baby-wearing, there was nothing right about that message..
Motrin, you might want to ‘crowdsource’ the Twitter MotrinMoms next round. “Wearing your baby seems to be in fashion. Update Monday Morning: New Mainstream Media Links Per Sandra Foyt On Living By Learning (an ironically apt name for this incident, right up there with our new global blogger book to benefit Variety the Children’s Charity:) Age of Conversation 2: Why Don’t They Get It? I agree with Sandra, I think this one will be another ‘teaching moment’…but truly, folks, how many must we have? I saw that ad while flipping though one of the monthly magazines and it totally floored me – in a bad way. The last line was so condescending. How annoying I thought — the baby wars have just been upped another ante, as in, suffering (and what you wear) can make you a better mommy. This is one of those cases where the subliminal message was as important as the direct insult itself. As at least one blogger pointed out, the above text was accompanied by strategically placed cuckoo sounds. I’d say there was a lot of not-thinking going on. What concerns me now, is that the take home message may be to merely have media execs prepare for crisis management. What I’d like to see as well is more of an effort to promote a positive exchange, and understanding, of the target audience. Thanks for your thoughtful comments and as always, my question is ‘now what?’ What can that brand do to gain back trust, or is it lost forevermore? What can we as parents do to use this media to give voice to policy positions and large scale media and marketing changes by uniting in community to be a voice that’s heard loud and clear, “this is not okay, people.” Sure would come in handy with the early sexualization cues, negative pop culture relational aggression and such, n’est ce pas? @ Andrea, I think your word ‘condescending’ is the right one…it does nail that whole sacrificial lamb/suffer on behalf of the baby/you’re never enough as a mom or a woman offensive drivel quite well. Plus all the nasty, disrespectful tweets and posts about #motrinmoms themselves — the ones who took the time to complain — is really bringing me back to the Target days. Hope Jessica G. handles it better than I did! Personally, I have no regrets on taking the high road, as a defensive fuss-fest is NOT what I want Shaping Youth as a ‘brand’ to be known for…speaking out, yes, spinning in the Twitter du jour, no… Not interested in being a ‘one-topic-wonder’—our conversations are much more multi-faceted. I think others are getting the brunt of it, okay with me, I have no axe to grind. Totally agree with that new parents particularly should be ‘hands off’ as well as ‘hands free’…Sling away, babywearers! (also glad to hear you’re taking the high road; always recommend it even when the backlash/reverb gets muddy) Hang tough! Nice work on getting the whole story in one place, Amy. More than anything this mess is making me miss my baby wearing days. I actually cried when I passed down my fave front carrier. It is in very good mom and baby hands, though and I’ve seen the new bonding in action. And I’m finally on Twitter, thanks to Jessica. Well Amy, my inbox is crammed with words you usually hear in the drunk tank. How will I ever thank you for your wonderful phone call, for your cautionary tale? *sigh* It could’ve really bothered me but I realize they’re the same insecure people who picked on you and that they’ll soon swarm around some other woman. Probably because their Mommies never held them and they didn’t go to therapy. I am truly inspired by the women of the web. Oh, Jessica, I was hoping you’d make it through unscathed…you sounded much tougher than I via phone; but it’s grand to see your sense of humor is fully intact. And my other one learned from our ‘tarzhay’ tragedy? Gotta call it like you see it, ya know? And @Tara…I long for those days too, especially in these teen years beginning when it feels like soooooooooo long ago and yet, simultaneously, as if it were yesterday. sigh. Hold ’em close, ladies and gents…Precious times. Wear ’em well. Jessica is absolutely right — the swarm of insults will move on to another woman soon. What really was disheartening about the experience was the realization that misogyny is alive, well, and has internet access. I thought we’d come a longer way, baby. Hang in there Jessica — and everyone else who’s getting the same treatment. Interestingly, back when I was a baby this must have been in fashion since I have many photos of my Mom carrying me around in a side sling. I’ve loved the fact my son wore his babies on a front sling. So Motrin was out of touch with history and the fact that Dad’s often are close to their babies, too. And there’s more. In Canada, both the Mom and Dad can have 6 month leave from work. My nephew did this and very much enjoys carrying little April around on a front sling. So Motrin gave a rather skewed picture, that’s for sure. Bet there’s lots of Moms and Dads who won’t be buying Motrin. But then, maybe it IS a misogyny focus dominating the matrix here…What are your real world experiences, ladies? I’m fairly well buffered having spent my career self-employed popping in and out of work environs as more of an observer than a participant in the machinations, so I don’t feel I’m a strong bellwether for the realities of those that ‘eat their young’ in high stakes settings…whether it’s male or female behavioral backlash of office politics and such. Fill me in? What unfortunate marketing! Glad the company saw the error of their ways, even if it took a lot of people speaking out for them to realize it.